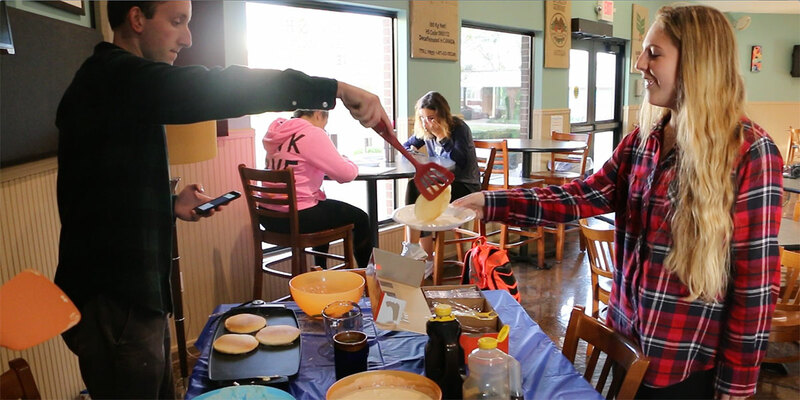 On the morning of Oct. 7, students woke up early, donned their favorite flannel shirts and embarked on an adventure to the Perk to earn the treasure of free pancakes. Students woke up on a recent Friday to put on their favorite flannel shirts and make way to the Perk to get free pancakes. MBU Outdoors, an organization developed to encourage students to experience more of nature, hosted its first Flannel Friday in which any student could come and get free pancakes before class. Stephen Crain, resident director at Pillsbury Huff, and Brain Knapp, director of alumni relations, formed the club with the intention of getting students outdoors. Crain and Knapp decided to have an event that would bring students together and to promote their organization. Students liked the idea of wearing flannel as well as eating pancakes in the morning. Students enjoyed the opportunity to get a free stack of pancakes while joining in community with their fellow classmates. The combination of flannels and flapjacks went well together. Students liked the idea of Flannel Fridays and anticipate more of them. MBU Outdoors will host future trips and hikes where students are encouraged to be a part of. Josh DuBoise is a staff journalist for MBU Timeline. DuBoise is a junior seeking a major in worship arts technology with a minor in broadcast media. Originally a Memphis native, DuBoise enjoys exploring St. Louis by finding local coffee shops, parks and restaurants to appreciate. DuBoise is active on campus by working as a resident assistant in Spartan Village and an audio technician for the MBU Ministry Teams.